In the usual way of such things, the encounter was over almost as quickly as it had begun. It was close to dusk, and the scouts had left the trampled human trail through the snow to ride east. 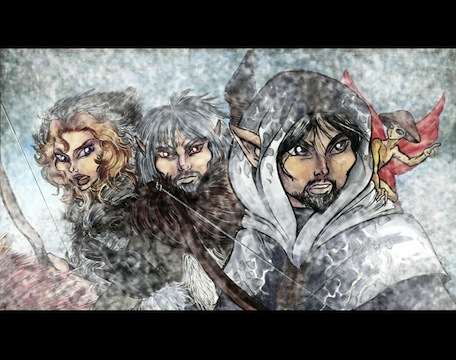 They knew the Fierce Ones were setting up their own camp as the sun fell, and now and again even heard the distant sound of that activity � booming human voices calling to one another in a rhythmic chant, similar to what the elves themselves did when several worked together to haul in heavy nets of fish. The three scouts knew it was time to find shelter of their own, ideally where they could see that camp from afar. To the east there was a rise which looked promising, a round height where a cluster of alder grew. They rode off away from the open, snow-blanketed bottomlands the Fierce Ones favored for riding, leaving the trampled trail behind. But it was not full dark yet, so the elves rode for that copse of trees carefully, hugging the low ground in between the gentle, deceptive waves of the plainsland. The closer they came to that hillock, the steeper the dips and folds of land became. Judging the growing gloom had deepened enough to risk exposing themselves on a height, Blacksnake pointed Wasp�s nose up to the top of the slope they had been flanking, expecting to find a frozen creekbed or some similar watershed running off of the high hill. The wind was blowing a steady, cold stream down from due north, bringing faint strains of human-stink and horse-dung to their noses. The wolves� footsteps made a crunching rhythm, but it was as deceptive as the flat-seeming landscape: they traveled in single-file, placing their paws in Wasp�s footsteps as he broke their trail, and at times they sounded as few as one or two hunters instead of a pack of six. Wasp crested the top of the middle-rise � and yes, the frozen creek which Blacksnake had expected to find below was there, but so was the plainsland pack, all dozen of them, either curled up to rest in the snow, or lapping at where the water still ran fast enough that it had not yet frozen over. One large she-wolf was already looking up the slope toward Blacksnake and his wolf-friend, her ears beginning to flatten as she heard Wasp�s footsteps breaking through the crust of snow. � and in the space of a heartbeat, everything changed from the promise of violence to an instant retreat. The plainsland pack was scattering, bolting away across the frozen creek and up the northern slope of the watershed. The she-wolf checked her headlong charge as though hitting the end of a snare-rope: she skidded back on her hindquarters in a spray of snow, then pivoted tail-end-over-nose to flee as fast as she could, ears flat and tail tucked. Wasp sprang after her in pursuit, and Blacksnake heard the crunch of snow as at least two of the old chief-wolf's own packmates followed. **No chase! No chase! ** he heard Brightwood wolf-send to the unbondeds, even as Blacksnake wrestled Wasp back from that pursuit. The old wolf submitted only grudgingly. Wasp's nerves were afire with adrenaline, and his mindtouch was hot with **give chase** and **fight** and **claim territory**. It was a struggle to get the old wolf to turn back, but Blacksnake was equally determined, if not more so -- they could not afford taking injury in a wolf-fight, and there was no sense in contesting for territory the tribe had no interest in attempting to hold. Wasp came to a stiff, jittery halt, ruff bristling and his head low with simmering aggression. Blacksnake rocked back on the wolf's sharp spine, looking back toward his tribemates. Brightwood was riding Redbrush forward as she called the three young unbondeds to her, and Farscout was still astride Duskgreeter at the rear of their scouting party, an arrow drawn to the string of his bow. He eased back on the bowstring, his pale eyes following after the last of the plainsland pack to disappear up and over the steep rise across the creek. **Did you see that? ** Brightwood asked cryptically, as Bristlepelt, Fireweed and Frostback jostled against Redbrush and licked at the red she-wolf's muzzle like half-grown cubs. Blacksnake shook his head, still urging a resistant Wasp to turn and rejoin their fellows. Continuing to savor thoughts of violence, the old wolf muttered a growl after the retreating plainsland wolves where they had fled up and over the northern crest of the slope. The chief-wolf submitted to his rider's demands with a sullen reluctance. **See what? ** Blacksnake asked, sending Wasp jogging back toward the others, the old chief-wolf still grumbling. Blacksnake frowned at the thought, and looked automatically toward the north. The Fierce Ones' camp was still out of view, but the sounds of them were clearer here, above the fold of land they had been clinging to for cover. He listened to the sound, alert for any variation that would indicate the humans having alerted on the lupine altercation. The distant chant did not alter, but the plainsland pack came back into view, trotting single-file to the east, putting distance between themselves and the archer. Blacksnake scowled to see that, knowing his own pack would be more interested in shadowing an invading band of wolves in wait of a better opportunity to attack. **See them go? ** Farscout sent, as he touched Duskgreeter forward to take a turn at breaking trail through the snow. **I bet they�ll come back at us tonight,** Brightwood countered, following after him with the unbondeds trailing at Redbrush�s heel. Wasp stood, waiting to take up tail-guard, and continued to rumble in threat as he watched the distant pack disappear into the east. The old wolf seemed aware of the stranger-pack�s odd behavior. Blacksnake watched them go as well, until they were mere dots against the white blanket of snowy flatlands, and when he felt a shiver course down his spine, the Hunt Leader knew it wasn�t entirely due to the winter cold. It was good news to start a morning off with. Goldspice found herself giving a sigh of relief to have finally received word from the kinsmen who had been dispatched to prepare the tribe's possible evacuation site. She stood a little straighter, facing into the whipping gusts of wind that blew from the northwest. Beside her, Nightstorm and the two boy-cubs had gone silent and still, knowing that the goldsmith was locksending with someone. Only Copper kept working, shoveling through a drift of snow in the leeward side of ancient old capnut tree. Her black she-wolf Flea was digging intently at the spot, sending an enthusiastic spray of snow out behind her, happily oblivious to the anxious concern around them. Dreamflight�s cheerful practicality put a smile on Goldspice�s face. She had worried about how the weaver would handle being assigned to the watch duty on Crow�s Ridge with Rainpace, when it was clear that the trapper had taken the return of the Fierce Ones especially hard. **In a couple of days, I hope to send Nightstorm and Greenweave; I don�t expect we�ll see Kestrel back soon enough,** she sent in return. She would have to think about what else could be sent out to the other watch-posts, both to give the watchers something to keep their hands busy, and to add to the supplies already being prepared at the Holt. The waiting grew too much for Rill. "Did they see the Fierce Ones?" the boy interrupted eagerly. "Have they spotted the Fierce Ones yet?" The boy's ruthless glee at that prospect was so appalling, Goldspice could not help but give a bark of laughter. "No, thankfully not!" she replied. "Just good news for a change! Your grandfather has reported in from Bluestone Cave; everyone is well and your sisters are hard at work there," Goldspice added, thinking the boy-cub would appreciate that tidbit of good news. Apparently not so much � Rill frowned at her, as though he had never questioned their safety and well-being. And maybe the boy had not, Goldspice realized. Maybe everything to him was weighed on the balance of whether or not it provided entertainment. Perhaps Rill's sisters and mother were all both off on a grand adventure, as he saw it, while he had been left behind at home, where he was reduced to doing chores. That sour frown on Rill's face suggested as much. "The Fierce Ones are to the east," said Cinder soberly, before Goldspice could respond herself. "My father is going to see them before Rainpace or Dreamflight do. Or before True Edge does." "My mother and father are watching them now," Copper added, shoving aside the last handful of snow and rooting out what she had uncovered. "Look! Flea's nose was right, there are some woodhens left!" Goldspice took the big grey-white fungal mass that the girl held up in her mittened hands. The mushroom had sprouted late in the autumn, then frozen solid with the first hard frost. She sniffed it suspiciously, but found it only slightly over-ripe. "This'll be delicious," she said with a smile and a nod to her group of young foragers. "Shall we keep digging and see if we can find some of that ground elder I saw growing here before the snows?" Nightstorm asked. "It was just sprouting when the leaves began to fall, so it's bound to still be tender enough." "I'd rather look for rose hips," Cinder said. "I know we didn't pick all of the berries from those bushes along the thornwall!" "Flea wants to find more mushrooms," Copper said as she stood and dusted herself off. "We should go and look for the humans ourselves," Rill said, still frowning and refusing to be shaken off his trail. "We could at least climb to the top of Home Ridge and look for them. They could be out there. They could have slipped past everyone else." Nightstorm made a face and looked about to say something, but instead she swallowed back her words and turned to Goldspice expectantly. Goldspice gave her friend a look in return and tried to weigh her response carefully. Being the acting-chief in her uncle Windburn's absence was an easier facade to sustain with the adult members of her tribe. Irrational though it may be, if was only with the tribe's children that she felt like a fraud. "You don't have to be scared�" she began to say. "I'm not!" Rill blasted back, flashing his teeth in an expression clearly inherited from his mother, Quick Fang. "I am not scared of the Fierce Ones! I just want to help find them � and first, too! I don't want to just sit around and wait like a frog on a log, while everyone else gets to go out and do hero-things!" Goldspice traded another glance with Nightstorm, thinking that she would need to keep an eye on Rill and come up with ways to keep him busy. Nightstorm�s look in return was sympathetic. Goldspice knew her friend was as impatient as Quick Fang's son to be out there and doing something � anything � rather than spend another night in the near-empty hometrees, waiting for word from their kin and going about the regular winter chores. Fierce Ones or no, there were still nets to mend, arrowheads to knap, baskets to weave, cordage to be twisted... busywork of all kinds that needed to be done, and even more of it now, with the rest of the tribe's hands out sitting at icy watch posts, or riding through the snow flurries in search of invaders. But if the best of their hopes bore fruit � if the Fierce Ones kept riding north, hunted the clickdeer herds and then went back home again without ever intruding into the Holt's territory � then the tribe would have lost the weeks of steady handiwork they always performed each winter, chores that allowed them to be prepared to meet the different challenges of the successive seasons to come. Obligingly, Dreamflight widened her mindtouch. She was sitting watch on a snow-dusted hide on a flat, open ledge at the crown of Crow's Ridge, shivering despite being bundled in her thickest fur coat and hood. The clouds were low and heavy with snow, obscuring nearly all the valley that stretched out below her. The wind blew constantly, stinging cold and gusting swirls of snow. Her fingers and toes felt numb, despite insulating layers of leather and fur, and the tips of her nose and ears were icy enough that at times she pinched them, just to welcome the hot flood of pain. Worse of all � her bladder was full and had begun to ache � but she wasn't going to drop trous and make water until fit to burst, because she didn't want to expose parts of her that would feel as though they had flash-frozen. Physically, Dreamflight was miserable � but worse was the boredom. Visibility was so poor, she doubted she would be able to see the tribe's enemies if they were dancing naked on the scree five bowshots below where she sat � but she did not dare stray from her post, in the remote case a messenger from Bluestone Cave came into range, or even anything equally urgent from the Holt. Determined to face the circumstance stoically, the weaver did the best she could. She turned her fur-bundled shoulder into the howling wind in order to shield her hands as she doggedly worked a drop spindle in one hand, feeding it a steady twist of wolf fur with the other so that the fibers twined together into a thick, grey-silver yarn. Rill scowled and dug his toes angrily into the snow, but both Copper and Cinder seemed to take her words fully to heart. "You sounded just like our grandsire," Cinder said then, grinned, "No, you sounded like my father!" "We should keep looking for more mushrooms, and then send them to Dreamflight and Rainpace," Copper said. "Or if we can find enough, send them to everyone, because they won't be able to look for them themselves." "We can do one better than that," Cinder said with rising excitement. "Let's go downstream to the birch grove, and look for chaga! It's hard work to grate them down, but nothing makes for better winter medicine! We can brew chaga tea for everyone, and send everyone waterskins of it, so then they won't get the sniffles or runny noses." "That's a great idea!" Nightstorm agreed, while Copper nodded with enthusiasm. Nightstorm and Cinder led the way off � Goldspice paused long enough to study the sky, thinking it likely they could reach the nearby grove of beech trees and then back to the Holt again, before the flurries of snow worsened. She waited until Rill and his wolf Softjoy had trudged past her, then fell in step behind them. From the angry set of the boy's face, the goldsmith did not believe her lesson had made much of deep impression � and she didn't expect a child of Quick Fang's to give to any argument easily, either. But equally � his father Suddendusk certainly was never one to carry a grudge. So Goldspice was willing to wager that the boy's usually sunny nature would return, given time and patience. And this winter, patience was certainly the hero's virtue. Goldspice watched Rill�s stiff stride, and the way he whacked at frozen leaves with his child-sized spear, and vowed to herself that she could stand to learn that lesson just as well as any of them right now. She also renewed her determination to remember every little thing she could that her brother Farscout or grandmother Easysinger had ever shared with her. Now would be the time to think of old lessons and what the tribe needed from them. And that was a sobering thought, itself; that she now had to think in terms of the tribe. Not just her and Moss, but everyone. That caused a chill that no winter coat could warm. Ed. Note: see the story �Behind Green Eyes� (by Angie C.: During the tense times, Thornbow has a chance to ask a question that has crossed his mind once or twice. ), which takes place at this same time. There was the barest whisper of sound as Pathmark slipped up beside him to watch the human hunters pass. **The Amber Hunters are learning from the Painted Faces, aren't they? ** the scout asked, his forehead wrinkled with concern at that thought. Beauty's one erect ear was all but quivering, and the wolf's scarred lip was retreating from his single, oversized upper fang. Notch reached out and rested a hand on Beauty's scarred head, knowingly rubbing at the tension-knot that had formed under the wolf's torn ear. He felt rather than heard the subterranean rumble of the wolf's growl go silent at his touch. The one-eyed wolf sat and gave a nonchalant yawn that exposed all of Beauty's teeth, then idly scratched with a hind paw at the side of his neck. Anyone who had not partnered with the clever old wolf for years might have thought Beauty was preoccupied with a flea bite � but Notch knew better. He'd learned the twists and turns of his friend's cunning, and knew the wolf had been thinking of starting some sort of trouble. Beauty always found it a thrill to steal a kill � challenge was the spice of life, after all, Notch thought with amusement. Notch chuckled to himself and kept rubbing at the stubborn muscle knot beneath his wolf-friend's ear, knowing his touch was received as a silent communication. Beauty knew that Notch knew that Beauty was scheming; he caught the sly glance the wolf cast his way, and saw the thoughtful look that weighed him. Another yawn then, even wider � then the grizzled head cocked to one side as Beauty finished studying his rider, and the wolf gave a sigh of disappointment. The muscle knot beneath Notch's fingers began to melt away into temporary compliance. Whatever Beauty's scheme had been, the trouble would wait another day. Snow crunched beneath paws to Notch's other side as Longtooth ghosted up to join them, nosing past Pathmark's shoulder among the evergreen branches to give his rider a view. Notch felt a hand settle on his shoulder. He slid a glance sideways and met One-Leg's shrewd blue stare. His father cocked his head to one side as he looked as his son, and Notch had the sudden, rotten sense of having been found out. He hated that knowing look of his father's -- it felt terrible to be caught out, when he had not even done anything. Not yet, at least. Pathmark turned his head to look at their elder, his expression startled. The tracker had spent the last few years busy with long-patrols while Farscout was busy tending his nest; he had not spent much time at all with the word-hunters, observing the humans like One-Leg had, or to a much lesser extent, as Notch himself had this past year. Notch snorted to himself and rolled his eyes, expecting what was to come next. Pathmark turned a worried glance toward Notch, clearly uncomfortable with hearing criticism of their chief. Notch gave the young scout an amused look. **The old windbag here should be wearing the tribe�s torc,** Notch sent with amusement, unable to resist needling his father. **You think the chief should be going to the Amber Hunters and Painted Faces, and telling them about the Fierce Ones? ** Pathmark sent with shock. **Don�t feed the cranky bear,** Notch sent dryly. The set of One-Leg�s bristling jaw was eloquent enough that he didn�t really think of the local humans as a threat to the tribe. Certainly not as grave a one as their chief still did. But the old hunter simply shrugged, his eyes following the group of humans as they climbed the snowy far riverbank. **There�s always ways of getting what we want with a minimum of risk to the tribe,** One-Leg finally answered. **It just takes some smarts and the ability to exercise those smarts. ** With those words, Notch felt his father�s hand squeeze his shoulder. He glanced One-Leg�s way again, and found those shrewd blue eyes fixed on him knowingly again. **You did bring the horn, cub-o-mine? ** One-Leg locksent then. Notch was startled enough that he brushed the weight off his shoulder-bag reflexively. His father noticed the telling gesture, and cracked a narrow grin. Notch watched as the last of the human hunters climbed the far bank of the river and marched off into the trees beyond. His father�s message didn�t take that much parsing � not from someone with some smarts, and the sense to use them. No, that wasn�t the fleabite that annoyed him. **Why didn�t you just nip the Fierce One�s bloody horn yourself, then, if you thought one of us should have it? ** he locksent to his father sharply, stung that the secret he had been hauling all this sorry-assed trip had not been a secret at all � at least, apparently, not to his father. Notch snorted at that, and reached out to fondle Beauty�s grizzled head. His scarred wolf-friend gazed back at him, tongue lolling in shared sour humor. Though whether Beauty was laughing with him �- or at him � Notch didn�t know. And some things were better not asked into, either. A raven was flying toward them, sweeping low from the distant hill country to the northeast. It was the first corvid Farscout had seen for days. He watched it as it banked to circle the three wolfriders once, swooping even lower overhead to tease the unbondeds as Frostback jumped into the air after it. Then the raven turned and flew back the way it had come, leaving the three youngest wolves to chase after it. Farscout continued to watch it as it flew away, wary of it. A single raven in wintertime was a rare thing � the birds roosted together in huge flocks and haunted the foraging grounds of the massive clickdeer herds, waiting for one of those thousands to die and provide the ravens with a ready meal. �Nasty knife-beak,� muttered Mushroom, seeking shelter within Farscout�s sealskin hood. Mushroom had been mobbed by crows once, sometime long before Farscout�s birth, and the pessimistic Preserver had never forgiven any corvid for that attack. "Getting closer and closer," Blacksnake remarked, no doubt because of the lone bird. "Whitewing Lake can't be more than a day and a half ride away now." "Let's hope we all make it there before the next big storm rolls in," Brightwood said, with an eloquent look behind them and to the west. The sun was well past its zenith in a sky that was bruised grey-purple with flat, snow-heavy clouds, and there was a visible curtain of snow approaching from the west. The weather had been sporadic snow flurries all day, light at first but growing heavier one after the next, so that the trampled path in the snow the humans had left was largely blanketed. The humans had left the curve of the Bounty River behind them late yesterday when its course had turned due east. The going was more dangerous now for the three elven scouts. They stuck as close as they could to the the low ground where the rippling waves of land gave them their only hope of cover � the stands of trees they had been finding shelter in had melted away north of the river, leaving the land empty save for snow broken by the rare patch of wind-scorched grass. The three elves knew too keenly that the band of Fierce One hunters who had ridden away to the west two days ago could re-appear anywhere on the western horizon, or even behind them on their back-trail. Ahead, there was little tree cover between the bend of the Bounty River and the those low hills far, far in the northern distance, where the hills flanked the belly-bulge of Whitewing Lake. With the threat of humans ahead of them and the possibility of humans coming at them from behind or from the west, the elves were eager to get out of this open landscape as quickly as they could. "There'll be game in those low hills," Blacksnake said, his mind always busy ranging ahead. "If we're lucky, the Fierce Ones will set up camp somewhere near where we can get a high vantage. We can sit tight then, shape a solid shelter, and just watch like crows from a perch while the humans go about their business." "The wolves need fresh meat. We'll need to risk a clickdeer of our own tomorrow night, if we've reached Whitewing Lake by then," Brightwood replied. Farscout's eyes were still turned to the east, after the raven. His eyes shifted northward at once toward a surge of movement as something dark and distant flowed up over a swell in the landscape. He had a split-second moment of surprise as his eyes recognized and registered � not clickdeer, not branch-horn � and then he was flinging himself off Duskgreeter's back. **Rider! ** he sent, even as he caught Brightwood and pulled her down with him, flat to the ground. He was aware of Blacksnake's scramble to join them as Brightwood swept off her snowcat-fur cloak and swirled the grey-and-white dappled hide over the top of all three of them, their only hope of camouflage in this empty land. **From the east? ** Brightwood sent, her mindtouch sharp with the shock of it. East was what they had assumed to be their safe direction, the direction they had agreed to bolt towards if spotted and pursued. Farscout looked again to the northeast, and saw two riders now, where before there had been only one. He focused on those two loping roundhooves and shared his image-send with his companions, until he felt Brightwood seize on them with her own eyes and her full focus lock. Only then did Farscout look away, shifting his gaze to the side, scanning the open country due east for any additional threat. He had shared the hunt with these two companions long enough to have a gut-deep certainty of each of their respective roles. Brightwood would track the immediate danger, while Blacksnake's attention at this moment would be partially split behind them and to the west, clearing that vector of danger. **Did they spot us? ** Blacksnake's question was almost on cue. Neither rider had reached after their weapons, and continued to move at an easy jog. Scouts, Farscout thought. One of them was hooded against the cold, wearing a shaggy, heavy coat that looked like it was made of a single thunderfoot hide. The other one rode with his hood down, his yellow hair streaming loose behind him. He wore the head of a black bear as a shoulder-piece of his winter coat, so that his right arm appeared to reach out of the beast's maw. Mushroom took that moment to peek out from its hiding place against Farscout�s neck. The Preserver moaned and ducked back within Farscout�s hood again, its slight body vibrating with fear. Duskgreeter stood sentinel in front of the three prone scouts, but Wasp began a stiff-legged stalk toward the humans, leading the other wolves with him. That was certain to draw the humans� attention, especially the bright splashes of Redbrush and Fireweed�s ruddy coats against the muted whites and greys of the snowy landscape. It was obvious the moment that the two riders spotted the wolves. One of the pair reined up so abruptly that his mount swung sideways and threw its head. The second � the bear-shouldered one � gave a shout audible from even where the elves were hidden. He drove his heels into his mount�s ribs and the roundhoof lunged forward, kicking up a spray of snow. �He�s riding straight for us,� Brightwood muttered under her breath. Farscout shifted cautiously, glacially slow as he eased his bow forward, lengthwise in the snow. With the same slow pace, he reached after an arrow. The situation was too precarious. There was nowhere the elves could run without drawing attention to themselves, and there was no cover to be had to improve their chances if discovered. Their best hope was to wait until both of the Fierce Ones were within bowshot, and then take them both down. But even that was ultimately a bad choice. They would save themselves in the short run, but in the long run � the Fierce Ones would try to find their missing scouts, and that would be likely to lead to disaster for the tribe. At least the next storm front was blowing in, on strong gusts which made swirling eddies of the snow caught in its blast. �I don�t like this!� Brightwood hissed. Farscout felt his lifemate�s tense body pressed beside his, and could almost taste her rising adrenaline. He leaned his shoulder into hers, and felt the touch of her mind in response. She was ready to fight � the scent of blood was in her thoughts, both dreadful and sweet with anticipation. Brightwood�s nerves were steady. If it came to a fight, she was ready to win it � but Brightwood would not be the one to set spark to tinder. The danger to them all was simply too great, and it was a danger she knew too viscerally. Another flurry of wind swept past them, and now the snow was arriving in earnest. Bear-Shoulder continued to approach, his speed steady; Heavy-Coat had begun to trot forward as well. Wasp had led his packmates a spear�s-throw forward, keeping to the broken snow of the trampled Fierce Ones trail. There he stood his ground, head low and ruff bristling, waiting for the bait to be taken. Redbrush, Fireweed and Frostback flanked their pack leader, while Brindlefur took a step forward past the chief-wolf, her head high and ears forward, knowing there would be a chase and eager to run. Duskgreeter shook himself and loped ahead to join the other wolves, unable to long resist the psychological pull of the pack during a crisis. The rider cantered his mount closer. Leisurely, he pulled a stout, curved bow from its quiver on his saddle harness, strung it, and put an arrow to the string. More than a bowshot-and-a-half distant from the wolves, he reined in and raised his bow. The roundhoof snorted and threw its head beneath the Fierce Ones as he took aim. Redbrush immediately turned and bolted for the west, as commanded by her rider. Duskgreeter followed a moment later, with Fireweed at his heels. At that instant, the Fierce One let his arrow fly. To Farscout�s horror, it sailed true, flashing across a distance which would be impossible for even Brightwood�s most powerful bow. Brindlefur shrieked and fell, thrashing in the snow with the long, red-fletched arrow through her throat. Frostback wisely ran for it, but Wasp stood his ground, snarling at the human archer even as the Fierce One put another arrow to his string. **Run! ** They were each sending it, their commands to the wolves so loud in Farscout�s head he was surprised the human couldn�t hear it. Old Wasp pivoted and ran as ordered � and an instant later, another red-fletched arrow was there, quivering in the snow where the chief-wolf had been just a heartbeat before. The Fierce One urged his mount forward again, advancing at a lazy trot, as his companion cantered closer behind him. The humans weren�t chasing after the wolves after all. They were riding toward Brindlefur�s body. **I�ve got Bear-Shoulder,** Farscout sent. When the humans discovered them, the elves would have only moments in which to strike � they could not afford to let any arrow go to waste. The human had reached Brindlefur now. He dismounted even as the other rider joined him. The two boomed at one another in loud, hearty tones of congratulation, even as the man reached down to lift up the dead she-wolf�s body and sling it across his mount�s back. The roundhoof snorted and tossed its head irritably, clearly not liking the burden of a dead predator. Then Bear-Shoulder laughed in a deep, thunderous peal of sound. He pointed to the trampled tracks in the snow and said something to his companion, the words rapid and flowing. Heavy-Coat replied in turn and lifted his shoulders in a massive shrug. Bear-Shoulders vaulted back astride his roundhoof-friend, and then both riders were turning their beasts around, noses pointed up the trail. **They were looking for the trail,** Blacksnake sent with a rush of relief. **They�re scouts, and they overshot their own people. ** As if in illustration of that observation, both riders spurred their mounts into a canter and rode away at a quicker pace, following that nearly-obscured trail north. Farscout slowly eased his arrow from his bowstring; beside him, he felt Brightwood do the same. She was trembling in the aftermath of adrenaline, and after a moment, Farscout realized he was shaking as well. Blacksnake reached across Brightwood and laid a hand on Farscout�s shoulder, his arm resting across Brightwood�s back. Now that the danger had passed, Blacksnake was no steadier than either of the lifemates. The three laid there in silence, while the snowstorm blew in over them. Perversely, it was Mushroom who came out of hiding first. The orange Preserver crawled out from its shelter beneath Farscout�s hood, then slipped out from beneath the edge of the snowcat-fur cloak. The Preserver stood upright and craned its neck, unable to see the riders through the steady gust-and-swirl of snow. �Agreed,� Blacksnake said. It was perhaps a measure of how shaken the Hunt Leader was that he didn�t argue or propose alternatives. Not yet, at least. But Farscout trusted his old friend�s mind was busy at work. Because the Fierce Ones had just unwittingly upended the scouts� assumptions of what their margins of safety were in this game. And they�d exposed another ugly truth � that the weapons the humans now carried were vastly superior to the elves� own. That had not been true of the band they had encountered all those years ago, but it was true now. The humans� mounts were faster, and their bows had greatly superior range. And the Fierce Ones had metal weapons. The only thing the elves still had was concealment... and they�d just had a taste of how uncertain an edge that would prove to be, in the flat, treeless tundra of the clickdeer plains where the humans were headed. The tribe needed to be warned.